Sweet Sewn Stitches: Arrrr You in Love?? Valentine's Day is one of the holidays I get festive with the kids and do a variety of fun activities. This year, I didn't find much time to do that unfortunately. Mr. E and I definitely made time to whip up some easy homemade Valentines for his school class! 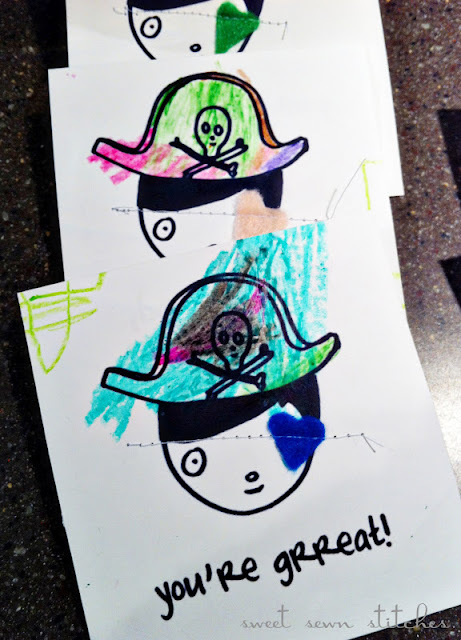 I found these fun and very boy appropriate pirate printables at Mer Mag. I love the cute, simple design with room for young creativity! Mr. E had a grrrreat time coloring the pirate hats and he even helped sew on the felt hearts. He also wrote his name on each one!! I am so proud of him! He wrote his name by himself while not looking at an example written out by mom. 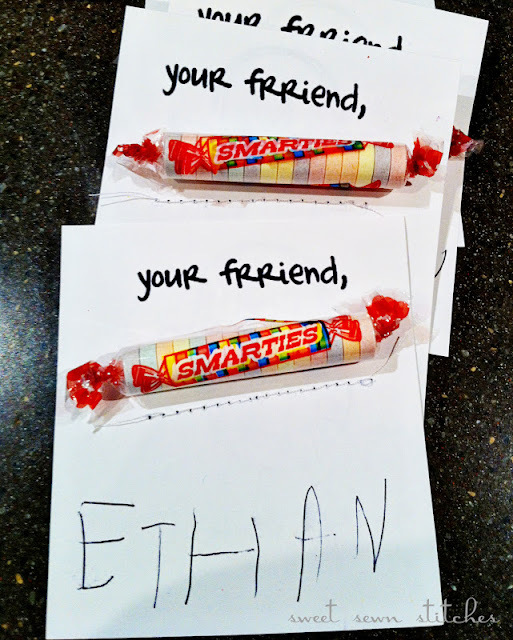 Definitely worth celebrating with some Smarties for mister smarty-pants. Hope you all had a fabulous Valentine's Day!! Super fun...my boys would love these! Very Creative! Thank you bunches for linking up with up last week for Mop It Up Mondays at i should be mopping the floor! Hope you can join us again tomorrow! Enjoy the rest of your weekend!